SIHH 2018: Audemars Piguet Royal Oak Offshore Diver Funky Colors. Four New Colors for Year Round Wear. The Audemars Piguet Royal Oak Offshore Diver ref. 15710ST keeps getting more colorful. Adding to the colorful AP Diver Chronographs and the black and silvered dial options, comes a new set of four funky colors for year round wear. The Royal Oak Offshore Diver still maintains its 42 mm case construction, display case back and AP calibre 3120 for these new iterations. All four new watches come with the traditional sturdy AP Diver rubber straps and rubber clad crowns, this time matching the color of the dials. 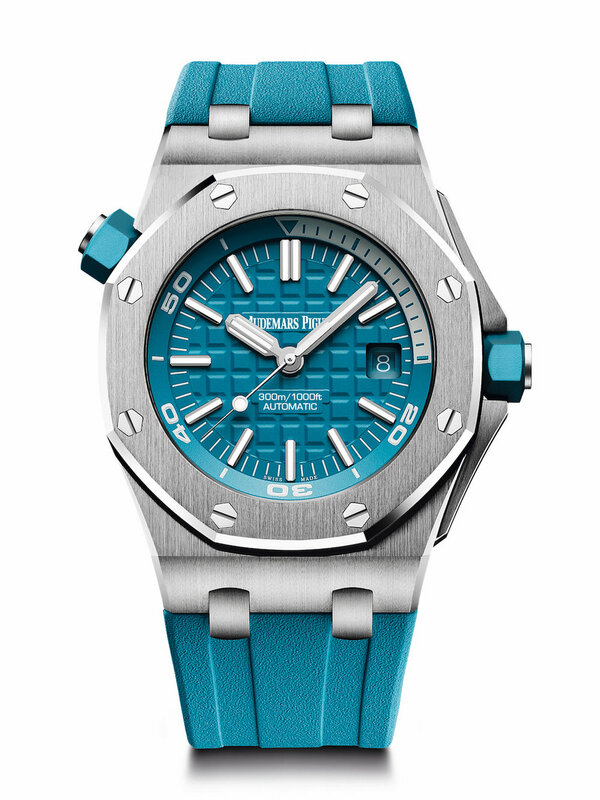 Whether you prefer bright colors or more muted ones, these new AP Diver quartet is sure to please almost everyone. The colors include: Turquoise Blue under reference 15710ST.OO.A032CA.01, Beige ref. 15710ST.OO.A085CA.01, Khaki Green ref. 15710ST.OO.A052CA.01 and Purple 15710ST.OO.A077CA.01. Live Pictures to follow later. Sticker Price $19,900 USD. For more info on Audemars Piguet click here. Posted on January 14, 2018 by Editor & Publisher and filed under SIHH 2018, Audemars Piguet, SIHH and tagged Audemars Piguet SIHH SIHH 2018 Royal Oak Offshore Diver Khaki Green Royal Oak Offshore Diver Purple Royal Oak Offshore Diver Turquoise Blue Royal Oak Offshore Diver Beige Most Popular Audemars Piguet Royal Oak Offshore Diver Funky Colors 2018.